FRP duct rodder is used to lay wire and cable, and can clean the telecommunications pipeline, in actual use or pay more attention to the following by the fiberglass threading plant to introduce you to the use of fiberglass cable. 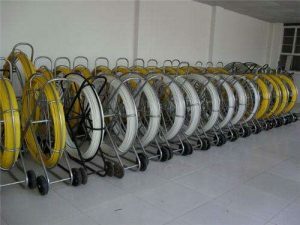 1, the protection of the traction head, first traction head alignment pulley, threading through the pulley work, if you want to pull all the fiber glass duct rodder out of the frame, you should pay attention to the last one to be stuck in the ring, post to It can be used when it is received. 2, because of their relatively hard FRP cable material in the case of cable pipe in the case of the angle, with special care to avoid the traction head is broken, when pulled out of the pipe carefully look good, do not make it damaged. 3, FRP duct rodder itself is a temperature limit, if encountered in the construction of overheating of the object, after use must remember to be placed in a cool place. 5, fiberglass threading have the largest straight-line traction, traction power if the machine is relatively large, it may lead to disconnect the pull line. 6, At the same time pay attention to maintenance, into a fixed space, so as not to be pressured by other heavy objects, affecting the service life. FRP cable in the use of time must pay more attention to our fiberglass duct rodder plant can provide you with professional guidance, you are welcome to inquire.